This apple and blackberry smoothie tastes like autumn and is super substantial making it the perfect on-the-go breakfast (hence why I’ve photographed it in a shaker cup!). 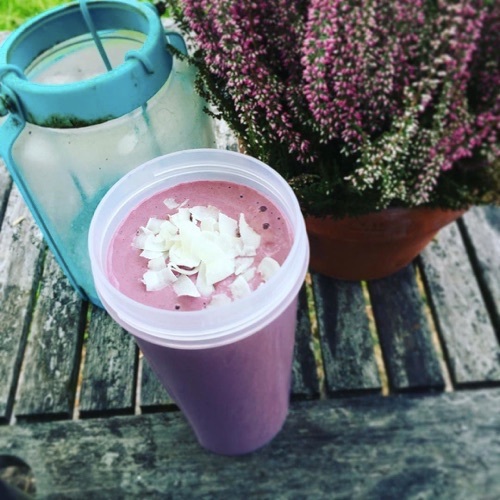 I like to make this smoothie when the apple orchard is in full swing, which seems to be timed just after blackberries are at their prime, and I’ve picked baggies-full to store in the freezer. You could of course buy all this stuff at the store but it’s just a little more rewarding when you’ve picked the fruit yourself! This recipe includes protein powder – I use Pulsin Whey Protein but it also works well with their Sunflower Protein for a vegan version. Put everything in a blender (I use a Froothie G2.1 power blender) with enough coconut water to blend. Add more coconut water to achieve your desired thickness (I like mine super thick!). 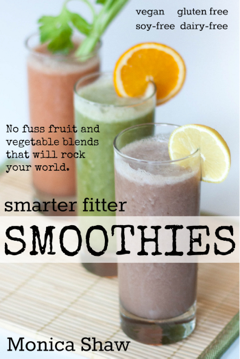 For more great smoothie ideas, check out my Smarter Fitter Smoothies book! Ooh, this sounds very inviting. I’ve been making plenty of blackberry smoothies, but rather densely didn’t think to add apple. Blackberry & apple crumble is a no-brainer though!